Home > columnists > feature > Gaja Lakshmi Paramasivam > JayanthaDhanapala > Which side are you on Dr. Jayantha Dhanapala? Which side are you on Dr. Jayantha Dhanapala?
" My solution has been to provide Human Rights and Equal Opportunity Services to every victim of autocracy I come across. I believe in Truth and the system of Dharma keeps rewarding me all the time. When I feel rewarded I believe that the victim is also rewarded." This weekend, we a group of Australians of Sri Lankan origin also met in similar spirit. There are many such groups that I personally am a part of. I tend to contribute more to substance than to structure in forums where majority do not seem to be connected to me through faith. This is a price we pay towards greater democracy. If I stuck to the groups where I enjoy fair level of respect as a leader, it would be easier for me to make my contribution. In one group meeting which is seeking to be democratic rather than being hierarchical (with its risk of being autocratic), one member suggested that we brought an out expert to speak on a core issue. I expressed my opposition to it and suggested that we shared our own experiences in that issue. I said that once I listened to an ‘expert’ it took greater effort for me to ‘erase’ the picture formed through such listening before identifying with my own picture. To me, we may complete the picture through an expert but in a democracy we need to start off with our own pictures. Hence the principle of ‘Customer is Right’. The Customer is taken as right until proven wrong. A fellow member promptly said ‘If you do not like it don’t come’. I said that’s exactly what I am saying. On my way home I made up my mind to stay away from that group’s meetings. Then I thought of all the expressions of support and trust by others in the group and decided to override the dictates of my ego and continue contributing as per the guna/quality of the individuals who responded to me and not give credit to those who seemed to have low assessment of me. I recalled what Gandhi said about Indian Politicians – that they were seeking to step into the shoes of the British leaders. I got even in my mind. To me this Friday Forum’s expectations as published indicate that they are not immune to this – just like in the Australian forum. These indicate lack of ‘ownership’ in the substance which often happens when there is excessive focus on structure. Structure is most important when majority participants are young ones. In other ‘informal’ forums such as the ‘Friday Forum’ substance is more important than structure. Structure shows us the path; Substances leads to realization for ourselves – leading to governance of ourselves by ourselves for ourselves. 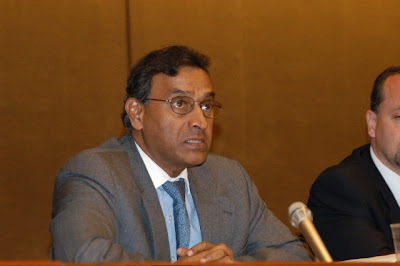 Dr. Dhanapala says in his statement – ‘The Friday Forum wishes to express its deep concern about recent appointments made to the Human Rights Commission of Sri Lanka, details of which were carried in newspaper reports. We are concerned about two important dimensions relating to the appointments: first, the process by which the appointments were made and secondly, the suitability of some appointees to serve on the Commission. As per my understanding of democratic system of recruitment – we get recruited through a combination of faith and merit based assessments. Within the lowest and highest layers – Faith usually drives the appointment/election and merit is for the rich middleclass in between. At the lowest we call them voters electing persons and at the highest we call them governors electing ‘issues’ such as preservation of our Natural Environments. I live in Australia and I actively use/d the services of the Australian Human Rights Commission. Most recently it was to complain against fellow Australian Dr. Palitha Kohona. I am however not expecting a merit based outcome because my past experience tells me that if I did expect as per my assessment of the responsibilities and rights of the Human Rights Commission – I would be disappointed. Also, as per my Dharma – unless I represent a structured Public Institution, my energies in ‘protesting’ are opportunity costs in relation to active service to the ‘needy’. So, I keep sending reminders of my rights as a citizen each time I feel hurt through unjust subjective discrimination and then submit it to my system of Faith to find my own value through myself for myself. I discovered through my latest complaint, that not many Tamils were actually interested in Due Process of Human Rights & Equal Opportunity Commissions. Every Australian Tamil could have done as I did. But as per my knowledge, no one other than I did. Hence I concluded that the War-Crimes issue is not a real need for the Australian Tamil community. It has not been discussed in any of the meetings of Australian Tamils, that I have attended and participated in since making that application. Structuring Selection criteria through formal Qualifications is part of Due Process and if the process is faulty – one would expect the qualifications to be inappropriate. However, in a system of faith – the preparedness to connect to the mind of the supervisor – in this instance the Government of Sri Lanka – is far more important than the ability to ‘show’ objectively measurable outcomes to the agencies close to those who certify our global skills, including the United Nations. To my mind, even the Australian Human Rights Commission does not have an independent mind in this regard. It is highly likely that the Sri Lankan Human Rights Commission would be even more ‘attached’ to past glories that go with the hierarchical system. Is Dr. Dhanapala for example independent of the United Nations? Some parts of his statement indicate otherwise. I often found the Selection Criteria as advertised by UN agencies being top-heavy even in terms of Australian reality – leave alone Sri Lanka, whose investment in Democratic systems is far less than Australia’s. When we are truly independent – we certify ourselves and seek to be certified by external experts only for functional purposes. I believe it was this independence of certifying authorities that helped me become an outstanding developer of democratic resource management systems especially in Australian Public Service. I started losing consciousness of my formal qualifications when they were not recognized by Australian employers. So I started at the level at which they recognized me from their comfort zones and then naturally accepted the promotions that came my way. If the above mentioned candidates are able to connect to the Government and its agencies as they are now, that would give some value to the Sri Lankan Human Rights Commission. They may not produce objectively measurable outcomes but we need to wait until we know whether compared to the past. more or less members of the Public seek the Commission’s services after these appointments. In Human Rights we need to measure effectiveness through independent members of the Public and not through agencies such as the Friday Forum who are a defacto system of Government albeit as its opposition. This must be not confused with an alternate system. It takes those used to power and benefits to become independent of their past. UN and its ex employees are the ‘experts’ against whom I spoke in our Australian forum mentioned above. If Dr. Dhanapala were to come here and face the same group, it is highly likely that he would be heard much more than I – an Australian who has gone to prison rather than withdraw from Due Process of Democracy. In Democracy, we need those who feel with the victims as if they are part of the victims’ group. Towards this we need to have had the experience as a minority of one sort or the other. Hence I ask Dr. Dhanapala which side he is on? – the Government or the People? Human Rights Commissions are part of the system of Democracy, especially through Equal Opportunity principles. Until we have a population that is committed to merit basis – we need the faith based hierarchical system for distribution of benefits – especially status through which to exercise authority. . Through the faith based system we feel ‘common’ ads in family system. When Dr. Dhanapala was nominated by the Sri Lankan Government, for the position of UN Secretary General, I felt confident that if a fellow Sri Lankan with global experience could do the job, I could. But unlike Dr. Dhanapala who had the Sri Lankan government to back him up – I did not have any government to back me up. I applied anyway – especially because I had practiced Democracy at the highest levels of Public Administration available to me here in Australia. The UN officers at ‘process’ level did write to me and I felt that that was a connection of ‘faith’, upholding the Dignity of a Victim. They said that I had to be nominated by my government. I expressly asked Mr. Howard who was then the Prime Minister, but there was ‘silence’ as usual. Now I believe that that application based on true feelings and belief, have contributed to development of real opportunities with those who need the services of global minded service providers. We just by passed the UN system. Often during the period of transition from the hierarchical system to democracy, those who are able to ‘show’ results quickly, tend to take up the leadership positions vacated by previous occupiers. But once in those positions they seem to be no different to their predecessors. This was also discussed in a recent meeting, in terms of the position of President of Sri Lanka. We need to consciously discard the stagnant parts of our past through those hierarchical positions, before claiming to be democratic. In Sri Lanka, most are NOT democratic. Hence a democratic Human Rights Commission would find it difficult to connect to majority victims of autocracy. Most of the time, they would work to uphold/maintain their positions. Even when they do connect to victims, it is highly likely that they would not be able to deliver the outcomes expected by the victims. My solution has been to provide Human Rights and Equal Opportunity Services to every victim of autocracy I come across. I believe in Truth and the system of Dharma keeps rewarding me all the time. When I feel rewarded I believe that the victim is also rewarded. True institutions are bound by common faith. This common faith has exponential value. Even if there is no structure to show this Common Faith – it still has value – Universal Value through the system of Silent Communication.